EZ-Grip is an ergonomic premium pipettor made of aluminium and stainless steel for oocyte denudation or gamete and embryo handling. To be used with EZ-tip or plastic pipette tips with a 0.9mm outer diameter. 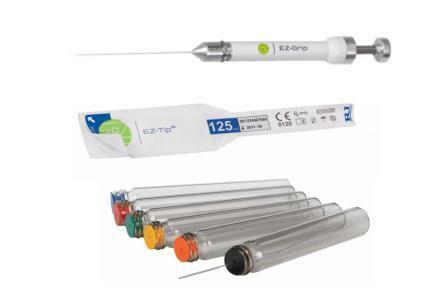 EZ-tip is a premium quality plastic tip for oocyte denudation or gameter and embryo handling. EZ-tip is batch tested to ensure embryo safety, highest pass mark in Mouse Embryo Assay (MEA) – at least 80% of the test embryos must reach the blastocyst stage. The batches are also certified free of endotoxins by Limulus Amoebocyte Lysate (LAL) test (<0.5 Eu/ml pass mark). EZ tip is sterilised by an approved gamma irradiation facility meeting ISO 11137 standards.